There are many ways to ensure a special place for reunions in the lives, hearts, memories and history of members. 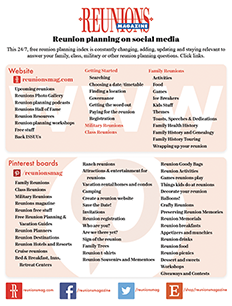 This section outlines just some reunion preservation ideas and we invite you to e-mail us your special ways of preserving and celebrating your reunion. Every family has a legacy: those stories that get passed down from generation to generation about amazing great-aunts, immigration, old family recipes, unbelievable feats, treasured heirlooms, and more. History is written in these stories, and culture is created. It’s important to realize that saving these stories is the hallmark to writing and preserving your family history. One of the downsides of oral traditions is that the original message can be distorted or changed over the years, and eventually lost all together. First-hand story-telling and photos are the most accurate way to capture the truth—not only for gathering facts, but also for seeing history through the eyes of the people who lived it. And it’s important to start as soon as possible. If you’ve ever worked on a family history project, you understand the sad feeling of encountering a fantastic old photo that’s discolored, bent, or falling apart, and the urge to preserve it before it’s lost forever. My family and I made a decision this year to become the authors of our own legacy after discovering how much has already been lost. My grandfather became interested in genealogy when he retired. As he traced our lineage back throughout the years, he came to a dead end. One of our ancestors had changed his name and moved so many times his history just disappeared. It wasn’t just his history, though. Now it belongs to us, too, and there’s an entire part of our story we’ll never know, simply because it wasn’t preserved. Now, together, we are writing down our stories and saving our photos so we can pass down our accurate history for generations to come. I love knowing that we are documenting our actions, and that my life will be remembered accurately, as will my tribe’s. It’s been said that history is written by the victors, but this isn’t true—history is written by those who feel compelled to write it down. 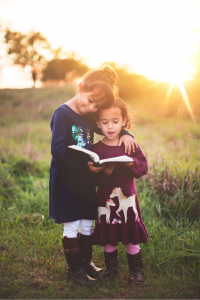 Preserving your family’s stories is the best way to write and pass on its history, as accurately as possible, in the words of the people who lived it. Start saving your stories now. History is in your hands. Shared by Hayley Irvin, Oklahoma City, OK, Community Success Manager at Weeva.com, a story collection and keepsake book-making site. Many Americans are scrambling with video cameras, tape recorders, smartphones and other high-tech tools to chronicle family histories before the memories are gone. When relatives share their histories, think how fascinated you are. Then, watch the children’s faces as they, too, find it intriguing. That look of astonishment on your kids’ faces means it’s time to make sure you record the stories for them to enjoy later. Baby boomers hearing, learning and appreciating their parents stories of the Depression and World War II can be very interesting (true) tales. Everyday life stories can produce eye-opening experiences. Children will be amazed to realize what things cost as little as 50 years ago and how people lived without smartphones, TV, DVD players, CDs, microwaves, computers, video games and many other things we now take for granted. There are many ways to incorporate memoirs into your reunion. Use them to create re-enactments of ancestors’ lives. Sell copies to help finance your reunion. Make them a permanent part of your reunion or family archives. Damaged, faded, irreplaceable photographs can be saved. Storage of your valuable heirloom photos in a dark acid-free environment will slow the deterioration process but nothing can stop it. New methods of restoration can reprint images. The original fragile photo is scanned. Then, in a labor-intensive, digital restoration process, the image is converted to a film negative and printed. Your original remains intact. Here are some basics for hiring a reunion photographer. Ask around. Get recommendations and check albums of friends and relatives. Ask how their photographers were to deal with. Check for complaints with the Better Business Bureau. Meet the photographer. Spend time with the person who will be photographing your reunion. See his/her actual work. Discuss his/her approaches and requirements. Compare prices. Packages vary in size and cost. Try boiling them down to comparable terms by dividing total costs by the number of photos you’d get. Hire the photographer. Make sure the person you met is specifically named in your contract as the photographer. Be realistic. Get the package that suits your reunion. Sweat the details. Make sure the contract spells out everything you’re getting, the total cost and when you can expect to get the photos. Use a credit card for protection. Stay in touch. Call occasionally to make sure the photographer is still in business. Family reunions are great times to make family portraits. Proper clothing can turn a picture into a portrait. Mixing solid colored clothing with the background eliminates distracting colors and puts attention back into people’s faces. One of the easiest ways to keep clothing from having too many distracting styles, colors and patterns is to have everyone wear commemorative t-shirts. If all the shirts or tops are the same color, attention is forced back to faces. It looks incredible. If you have different solid colors in the same tones for each family, it defines each family and looks fantastic. When I photograph families, I like them to wear long sleeves and pants, to keep flesh color mainly to the faces. J.R. vanLienden and his wife Darcy owned and operated Masterpiece Portraits. They specialized in outdoor portraits, many of which were created on Florida’s Gulf Coast beaches where they claim to have the whitest sand in the world. This is a great way to remember your reunion and it’s easy to do! The cover is made of colored, light card stock. Inside pages are collages of cut and pasted pictures. Imagine looking back at reunions and see family spending time together. And family members will probably be pleased to see themselves in the book. Thanks for a great idea, Lloyd! One Memory at a Time: Inspiration & Advice for Writing Your Family Story. by D.G. Fulford. (2000, 156 pages, hardcover, $16.95) Doubleday, 1540 Broadway, New York NY 10036. From Memories to Manuscript, the Five-step Method of Writing Your Life Story by Joan R. Neubauer. Ancestry, 266 W Center St, Orem UT 84057; 1994, 40 pages, soft-cover, $5.95.